What is Another Name for Nearsightedness? Other names for nearsightedness are: myopia and shortsightedness. In the United States, the words 'myopia' and 'nearsightedness' are used interchangeably. If you're into etymology (the study of the origin of words), the term 'myopia' comes from Greek word roots that mean "to close the eyes." This is a reference to the primary sign that a person is nearsighted — squinting. The other word that means the same thing as nearsightedness — shortsightedness — is a British term that's used frequently in other countries. Shortsightedness means exactly the same thing as nearsightedness and myopia. Regardless whether you use the term nearsightedness, myopia or shortsightedness, the condition these words describe is characterized by objects appearing blurry until they are brought close to the eyes. People who are nearsighted may have difficulty recognizing faces at a distance or reading road signs while driving. Children who are becoming nearsightedness will find it more difficult to see writing on the whiteboard in their classroom unless they are sitting near the front of the room. Besides blurry distance vision and squinting, other common symptoms of myopia include headaches (which may be related to muscle tension from squinting) and tired eyes. When looking at the eye chart across the room during an eye exam, people with shortsightedness will have reduced visual acuity. In other words, instead of being able to see the small letters on the 20/20 line near the bottom of the chart, their visual acuity might be recorded as 20/40, 20/60, 20/80 or some other fraction because they can only make out larger letters on the chart (the larger the bottom number of the fraction, the worse the distance visual acuity is). Thankfully, blurry vision from nearsightedness usually can be fully corrected with eyeglasses, contact lenses or refractive surgery like LASIK. Nearsightedness typically begins in childhood and many nearsighted kids think their blurry vision is normal. 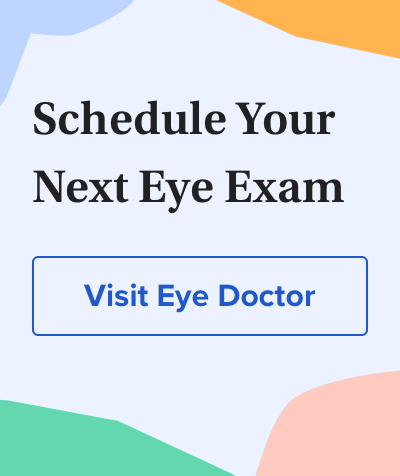 Even if your children aren't complaining of vision problems, schedule a comprehensive eye examination for them at the beginning of each school year with an eye doctor near you.